Mister Money Video Slot Guide & Review - Casino Answers! Mister Money is a 5-reel, 20-line video slot developed by Realtime Gaming, featuring a wild substitute symbol, scatter wins, multipliers, a free spins feature, a bonus game and a progressive jackpot. You can play the Mister Money Real-Series Video Slot at Bovada. Bets on the Mister Money slot machine are $0.01, $0.02, $0.03, $0.04, $0.05, $0.06, $0.07, $0.08, $0.09, $0.10, $0.25, $0.50, $1, $2.50 and $5 per line. You can select from 1-20 paylines on a spin in Mister Money. The lowest bet you can make on the Mister Money online slot game is a penny per spin up to the highest total bet of $100 per spin. Mister Money offers a very good betting range that high rollers (as well as lower stakes casual players) can enjoy. Players can manually skill stop the reels on Mister Money by hitting the “Stop” button during a spin. To play the Mister Money slot game, select your bet and hit the “Spin” button. The highest paying symbol on the Mister Money video slot is the White Diamond symbol. 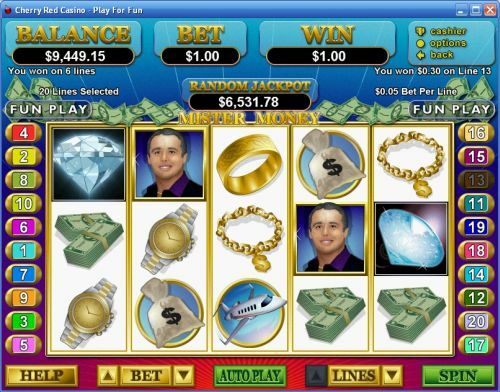 If you hit 5 of a Kind of the White Diamond symbol on a selected payline, you will win Mister Money’s 5000 coin top fixed jackpot. The White Diamond symbol will substitute for all other symbols in Mister Money, including the Red Diamond scatter symbol. The White Diamond symbol will also double the prize when it appears in a winning combination. The second highest paying symbol in Mister Money is the Mr. Money symbol, which pays up to 1250 coins by itself or 2500 coins with a White Diamond substitute. The scatter symbol on the Mister Money video slot is the Red Diamond symbol. 2, 3, 4 or 5 Scattered Red Diamonds will pay out 1X, 2X, 5X or 50X your total bet. These winnings can be doubled when the White Diamond substitutes in a winning combination. When 3 or more Scattered Red Diamond symbols appear in a winning combination, you will trigger the Mister Money bonus game. In the bonus game, you will get to choose from 15 money bags to reveal either 3 free spins or a free spins multiplier. You will receive 3, 4 or 5 picks depending on how many scatters triggered the feature. You will receive 5 free spins plus anything you win from the bonus game. Free spin wins are doubled, plus any increased multipliers you win in the bonus game. If you re-trigger the special feature, you will win 10, 15 or 25 additional free spins (for 3, 4 or 5 scatters respectively) played at the current multiplier. With a theme such as Mister Money’s, you can expect for Mister Money to have some mega payouts. This comes in the form of a progressive jackpot. At the present time, this progressive jackpot is at $6,800 but will surely get much higher before it is won. The jackpot is triggered at random, thus can be won on any spin you make on the Mister Money video slot. Progressive Jackpot wins are added to other wins. Random Jackpot contribution is no more than 1.5% of the total Return to Player. To try and win the Mister Money progressive jackpot, all you have to do is play for it at Bovada. All symbols pay left to right, except for Scattered Red Diamonds, which pay left to right and right to left. Wins on different paylines are added. Scatter wins are added to payline wins. Scatter wins are multiplied by the total bet. Payline wins are multiplied by the bet per line. Highest win only on each selected payline. Maximum win per paid is 50,000X bet per line. Hit the “Autoplay” button to open the autoplay settings. You will be able to set the number of spins, set it to stop when the jackpot is won, stop if a win exceeds or equals (any amount you input), stop on any win, stop if your balance increases/decreases by any amount you input and stop once the feature is triggered. You can stop the Mister Money autoplay mode using the “Stop Auto” button to deactivate it. Turbo Play can be found in the autoplay settings. Mister Money’s presentation is a little lacking by today’s standards, as most RTG Real-Series Video Slots have a much more lively feel. Still, it’s a solid video slot that’s worth playing when you sign up and deposit at Bovada. Can I play a free Flash game of the Mr. Money video slot for free? Yes, Mister Money is one of the selective RTG video slots that you can play without downloading any casino software at Bovada. 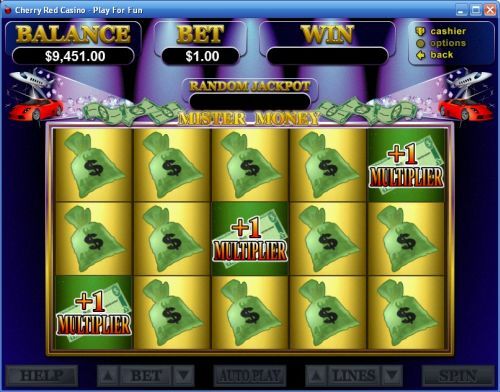 This is the only way Macintosh slots players can play the Mister Money online slot machine. If you experience any issues with the Instant Play Flash software, make sure you have the latest version of Adobe Flash Player installed. Can players from the United States play Mr. Money for real money? Yes, players from the United States of America can play the Mister Money slot game at Bovada for free or for real money. How do I win the Mr. Money progressive jackpot? You don’t need to do anything to win the Mister Money progressive jackpot! It is won at random, so all you have to do is play and hope luck is on your side. To increase your chances of winning, raise your bet per line.